Gun control activists have repeatedly used national tragedies to try to push their agenda. They use grieving victims to invoke an emotional response and spread misinformation falsely claiming that enacting their agenda would have prevented these tragedies and will prevent future tragedies. Just yesterday, the former executive director of former New York City Mayor Michael Bloomberg’s anti-gun group admitted that mass shootings would not have been stopped by stricter gun control. Media coverage of mass shootings repeatedly notes these tragedies take place in areas with some of the most restrictive gun laws in the nation. Groups sponsored by Bloomberg have tried to inflate statistics and circumstances to play on the public’s emotions, and have been called out by independent fact-checkers as being false and misleading. In predictable fashion, one day after the former executive director of Bloomberg's group publicly stated that their gun control agenda will not prevent future tragedies, Bloomberg's Everytown for Gun Safety held an emotionally charged press conference urging Congress to enact their anti-freedom agenda. Just as the tactics of anti-gun groups don’t change, neither do the facts. The anti-Second Amendment agenda being pushed by Bloomberg will not prevent these tragedies from occurring. It's clear that their agenda is not to make children safer or prevent tragedies, but to enact an extreme anti-gun agenda. If they were truly concerned with saving lives, they would work to address our broken mental health system and ensure that violent criminals are prosecuted to the full extent of the law. 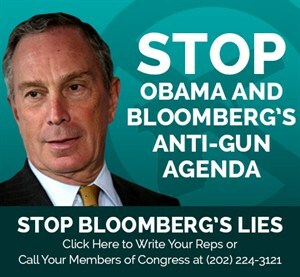 Michael Bloomberg and his operatives are not telling the truth to Congress or the American people. Your U.S. Representative and Senators need to hear from your today. Tell them you won’t stand for more ineffective bans on firearms; so-called “universal” background check systems; or any other gun control scheme. Let them know you want serious legislation passed to fix the broken mental health system in this country – that is the real issue. Bloomberg thinks he can buy the American people and the U.S. Congress. He may have billions of dollars, but he doesn’t have you. Please contact your Senators and Representative today to stop Bloomberg’s lies! You can contact your U.S. Senators and your U.S. Representative by using the "Write Your Lawmakers" tool at www.NRAILA.org. You may also contact your Senators by phone at (202) 224-3121, and your Representative by phone at (202) 225-3121. Paul M. Barrett, writer for Bloomberg Businessweek wrote that conventional gun-control proposals will not deter those committed to perpetrating acts of senseless violence. “Forget conventional gun-control proposals” in the case of “the suicidal young man determined to express his pain and rage by taking innocent people with him.” California has “some of the toughest gun-control laws in the country” but “[t]hose laws didn’t stop, or even significantly slow” the Isla Vista perpetrator. They are already required for dealer sales of firearms, whether at brick and mortar shops or gun shows. They are already required when firearms are sold across state lines, including firearms advertised online. They do not, nor can they, identify or stop persons whose behavior has not already resulted in some intervention by the criminal justice or mental health systems. They are necessarily backward-looking, not forward-looking. According to the Bureau of Justice Statistics, most criminals who use guns get them from theft, on the black market, or from acquaintances. Background checks are irrelevant in these circumstances. According to the BATFE, nearly half of illegally trafficked firearms originate with straw purchasers. Background checks cannot stop straw purchasers; indeed, straw purchasers exploit the current background check system. It is already illegal for a person to transfer a firearm to another individual who the person knows or reasonably should know is prohibited by law from having it. This applies whether the transaction is conducted by a dealer or private person. It is already illegal for a person to provide a firearm to another individual who the person knows intends to use it in a violent or drug trafficking crime. This applies whether the transaction is conducted by a dealer or private person.